Phytecs > Katarzyna Starowicz, Ph.D., M.Sc. 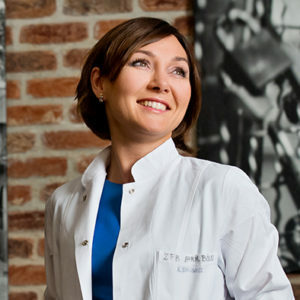 Katarzyna Starowicz, Ph.D., is an Associate Professor in the Department of Pain Pharmacology at Institute of Pharmacology, Polish Academy of Sciences, where she directs the Pain Lab. Dr. Starowicz has a longstanding interest in the area of pain and analgesia. Dr. Starowicz’s interests focus on bridging large gaps in the field of pain neurobiology concerning the pathomechanisms of chronic pain with the aim to pinpoint novel targets for the development of new pain therapies. Dr. Starowicz been involved in studies describing the role of CB1 and TRPV1 receptors’ cross talk in animal models of neuropathic pain. Dr. Starowicz’s research focus is also aimed at the issue of degenerative joint disease, osteoarthritis. Currently, Dr Starowicz’s group is engaged in determining the cannabinoid function in chondrocyte regeneration, in determining the inflammatory component in OA as well as in studying the function of cannabinoid receptor ligands in the regulation of chondrocytes and osteoblast activity. Dr. Starowicz holds M.Sc. degree from Jagiellonian University in Krakow, Poland and Ph.D. degree from Utrecht University, the Netherlands. She received her habilitaion in 2013 at the Jagiellonian University Medical College. She published many scientific journal articles, and book chapters. She frequently lectures at international meetings. She is a member of the British Journal of Pharmacology Editorial Board. She also serves as a reviewer for several scientific journals.